Bought a fermentation fridge and hooked up with temperature controller and heat belt (fridge is off for winter). Thermometer is taped to fermenter with polystyrene over it to try and measure temperature of liquor rather than air around it in the fridge. All well and good but was shocked to do a little test during white wine kit fermentation (21 degrees) to find ambient temperature in fridge was between 12 and 15 degrees. Trap for young players as had put beers in there too hoping they would bottle condition at 21. I wondered if differential was too high (ie my thermostat reading was off) but strip thermometer seemed to confirm wine at 21 or thereabouts and google seemed to support a difference of a few degrees between wort and ambient temperature when beer is fermenting. Wine perhaps with its more vigorous fermentation (I'm assuming given higher alcohol outcome) could well have a higher differential. Final conclusion for me though is that apart from forgetting bottle conditioning while fermenting I need to ensure when fermenting two things at once in the fridge that they are in at the same time and are similar (eg two beers). This is to ensure that the two worts/wines are at the same temperature. 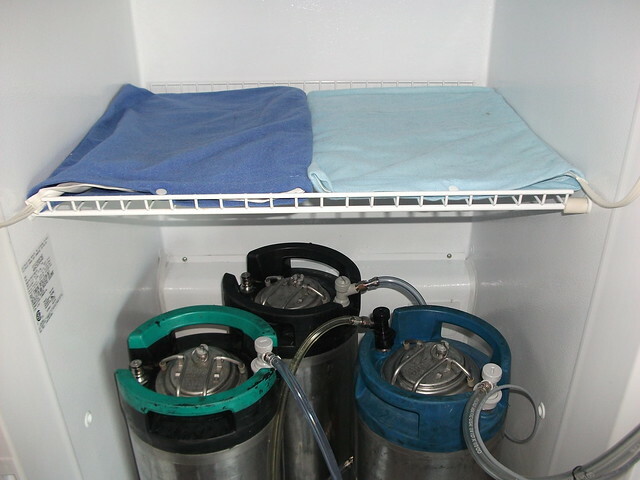 Presumably different substances or the same substance at a different stage of fermentation will generate different heat and require a different ambient temperature. Either that or do a few trial runs and see what temperature the second fermenter is at. I guess it depends on how critical the temperature control is for the brew. EDIT just took temperatures again - taped on fermenter - 21; sitting on top of fementer - 18ish; up on next shelf - 16 ish. What kind of temperature controler are you using? Fermenting liquids do give off heat especially during the most active phase. I have never used a heating belt so I can't say how much of a range there could be. I guess if the belt is doing a good job of heating just the wort and the temp probe is reading only the wort temp; ambient air temperature may have no bearing on anything. I've used heating pads before and had the cooling turn on and off. I had to experiment a little, both on high cycled too much, turned both down to medium or low till it seemed right. This was in my garage during a winter. In addition, running a fan would more evenly distribute the temperature. Last edited by Mad_Scientist on 09 Nov 2016, 08:40, edited 1 time in total. Thanks for your replies. I am using an InkBird ITC308. I suspect the brew belt is not strong enough to heat the whole fridge. I've ordered a heating tube and little fan.